While 4- to 6-month-olds still have breast milk or formula throughout the day, older babies are ready for food to feel full. 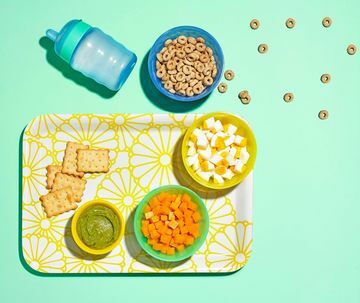 You can’t go wrong with snacks that are real foods—meaning they’re minimally processed, with ingredients you recognize, says Natalie Muth, M.D., R.D.N., coauthor of The Picky Eater Project. Fruits, veggies, eggs, avocado, cheese, and bread with a thin smear of peanut butter are winners. Always mush or dice all food to prevent choking. RELATED: Should Peanut Butter or Eggs Be Your Baby's First Food? Snacks should be about a quarter of the size of your baby’s normal meal. So part of a small banana or a scrambled egg or slice of cheese. “Cereal is a little more processed than other foods, but it’s still a decent choice because it’s easy for a baby to pick up,” she says. “Now is the time to expose your baby to as many textures as possible,” says Dr. Muth. Serve up an array of healthy options and don’t stress if she gets messy with all of it. Kids’ eating habits reflect their families’, so if your baby sees you choosing veggies instead of potato chips, she’ll want the same. Yep, this golden rule for mindful meals applies to snacks too, says Dr. Muth. And power down screens. Think of snacktime as bonding time to sit with your baby and take in his world.